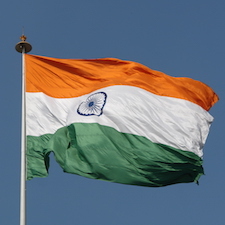 Flag of India. Photo by Yann Forget. Science has been at the pinnacle of endless human curiosity. Today, scientific research is driven not just by curiosity but also by the need for an improved quality of life that enables longevity with good health. Countries across the world have caught up to the truth of Pasteur’s words. The world today is perfectly poised for great leaps in science and technology. Automations have made research quicker and the large avenues for scientific publishing have enabled widespread access to research findings. The landscape in India is no different from the rest of world. Although a little late to the party, the change in approach to science in the last decade has been nothing short of phenomenal. Despite an economic crunch, opportunities for research in India are on the rise. The growth has largely occurred in two fronts: (1) Number of people opting to pursue a career in research; and (2) Increase in funding for research and infrastructure. Typically, growth in one frontier has enabled the growth in the other. The creation of several new government institutions, such as IISERs (currently 7 in number spread across different states), IITs, and inStem (campuses in Bangalore and Vellore), dedicated to both basic and applied scientific research, has opened the gates for young investigators to establish their own laboratories. The requirement for research personnel in turn provides greater research opportunities for those interested in pursuing a career in science. The number of available fellowships for every stage of research has dramatically increased. The scholarships for Junior/Senior research fellows (awarded by several funding agencies)1 have served to attract young minds, in particular due to increased fellowship amounts. The increase in stipends and salaries has diminished the pay gap between research and other professions, making it more attractive. Similarly, the number of people opting for postdoc training in India is also witnessing an upward trend due to increased number of fellowships offered by government agencies.2 Being heavily reliant on graduate students to carry out the research, laboratories across India are now looking to hire experienced post-docs to undertake new projects. This practice has translated into better quality research, both in terms of output and novelty. Therefore, research findings from India are now being increasingly published in top-tier journals. In addition to the fellowships, several initiatives have been taken to address other research needs. An investigator today has the option of applying to several different funding agencies depending on his/her research theme. With a view to encourage more women in science, several funding programs exclusive to women investigators have also been introduced, thus reducing gender disparity.3 With the Indian government avowing to support start-ups, the current climate in India is conducive for an experienced researcher to become an entrepreneur. The country is also witnessing increased collaborative efforts between hospitals and research centers. An increased involvement in research is also seen in private health organizations. This focus on clinical research has direct implications for improving quality of healthcare in the country. In addition to biological research, research in public health, wildlife research, ecology and conservation are other areas of emerging research. Although a large number of positive changes have occurred over the years, several pitfalls continue to plague the research community and still need to be addressed. The strong dependence on government initiatives for funding can be a rate-limiting step in scientific development. Time delays in development of infrastructure do not bode well for India, given the rapid strides in science that are made every day. Manufacturing of reagents and research supplies in India is limited, so delays in the procurement of research material is another huge barrier since Indian labs rely on imports. This also imposes a huge cost burden. Establishment of in-campus warehouses can bring down the delays to some extent. Barring a few top institutes, the struggle to publish in top journals continues to remain monumental, thus reducing the visibility of research findings from Indian labs. While there is no quick-fix to these problems, a large number of them stem from research being strictly of academic interest. Only with the establishment of biotech industries that are involved in research can several of these problems be suitably addressed. Contributions to the welfare of the community are ultimately the true test of success for any research initiative. While there have been many favorable measures in the past few years, here’s hoping that there will be several more measures that will change the face of modern research in India. A (metaphorical) torch-bearer in the making! Swapna is a PhD student at Sree Chitra Tirunal Institute for Medical Sciences, Trivandrum, India where she studies cell death mechanisms in Parkinson’s Disease. Sabarinath has a PhD in Glycobiology from the Department of Biochemistry, Sree Chitra Tirunal Institute for Medical Sciences, Trivandrum, India and is currently working as Research-Associate at inStem, Bangalore, India.